← From awareness to action: Steps to prevent breast cancer. Dad appreciates the healthy Halloween treats. The kids…not so much! We took our kids trick-or-treating in our neighborhood this evening. Predictably, they got lots of candy. Lots. But some people gave other treats, too. Like little toys, glow sticks, and stickers. To be honest, the kids were almost as excited about those things as they were to get candy. Almost. 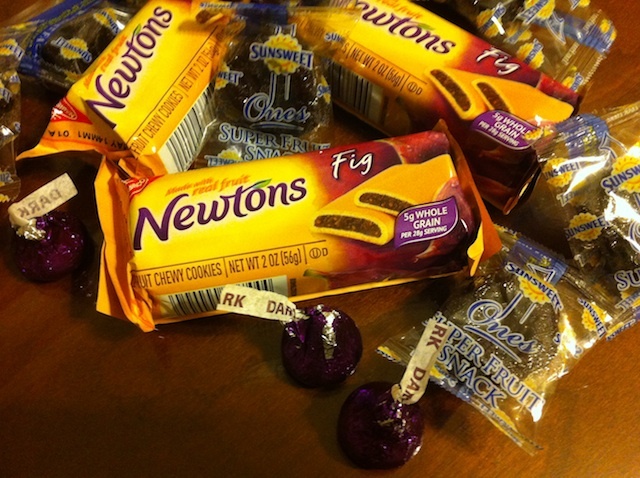 One of our neighbors tried to impress me by having the healthiest Halloween treats I have seen: mini packages of Fig Newtons, individually wrapped prunes, and dark chocolate Hershey Kisses (because dark chocolate is healthier, right?). It worked. I was impressed. The kids…not so much! This entry was posted in Just for fun and tagged candy, halloween, health, healthy choices, nutrition. Bookmark the permalink.